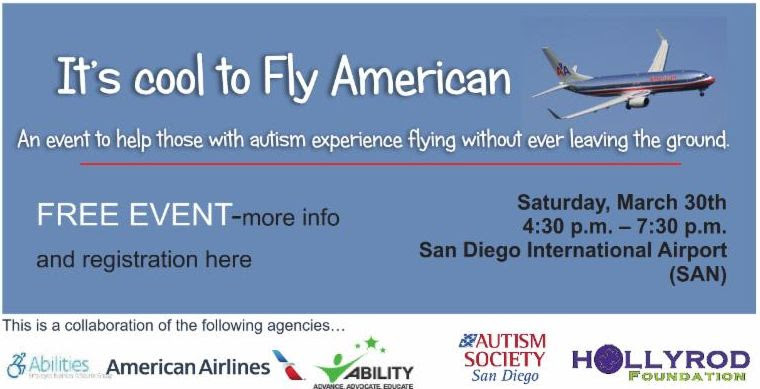 “The American Airlines Abilities Employee Business Resource Group partnering with the HollyRod Foundation, Autism Society San Diego and Ability Employee Resource Group from AT&T, will be hosting a travel-rehearsal event at the San Diego International Airport (SAN) on March 30th. This event is designed to alleviate some of the stress that families who have a family member with autism, intellectual or developmental disabilities experience when traveling by air. It will be realistic and provides families with the opportunity to practice entering the airport, obtaining boarding passes,going through security, and boarding the plane. This event is complimentary and is limited to the first 120 participants that register. All ages welcome. Family members who would normally travel with your family member with autism are welcome to participate. Registration Closes Tuesday, March 27, 2019, or when full. When responding, please include the number of adults, number of children, names of all attending, gender (male or female) and dates of birth. This information is needed for TSA clearance. As a friendly reminder, all adults will need a Government-issued I.D. to clear TSA Security the day of the event. Feel free to bring any items that your family member would normally take on a flight to help ensure a successful experience (i.e. IPAD’s, talkers, service dogs, sensory items, blankets, ear plugs, headphones, books, etc. ).